A somersault of jumpy nerves before the exam, butterflies in the stomach before the final competition, goose bumps before stepping onto the stage, a mortal fear before marriage (not debateable)…stress coupled with moderate amount of uncertainty and fear are the but obvious visitors before any big event. Ask any supermodel what she does before making a ravishing entry onto the stage or the cricketers of Kings XI Punjab team gearing up for the competition ahead. What they do before the big match? The answer is more or less the same - try to calmly deal with stress. And you thought they were some super robots sans basic emotions. In fact it wouldn’t be an exaggeration to say that a cricketer goes through the stress bouts like a soldier at the border. So, when it is a do-or-die situation what is it that helps? Sports people take their pick. We have answers coming right here from the hometown, where the Kings XI Punjab team is flexing muscles, practicing for the DLF IPL ahead. Take it from the India-smitten Brett Lee, who likes to jamm’n’ whenever he has the luxury of time. “Some time in the gymnasium and some laps in a nice swimming pool does the needful for me,” offers the cricketer. So, whether it is at the Oxy Gymnasium at Mountview or sessions at Tress Lounge (this includes Aqua Pool, Seven Seas spa), Brett likes to maintain a sound mind and body. As for the other champ, Irfan Pathan, stress is a state of mind that can be handled by utilising energy in the right way. “I carry my laptop with me, so whenever I feel like de-stressing I just pick up a movie and savour it till the end. It does the trick for me,” smiles Irfan. And who said it is just the players; the ones managing them at various levels also need a dose of detoxification. Puts in Arvinder Singh, senior vice-president of Kings XI Punjab, “The rigmarole of events can be pretty tiring and this is where you need something that can provide energy. Golf is one sport that releases me of all stress. Some good shots at the course offer a refreshing change,” he adds. There is definitely more to this bindaas yet focused guy. Lavish bouts of emotions (courtesy season 1 of IPL, where we saw him sobbing endlessly), were just a one-time incident, but life is a right mix of family and cricket for Sreesanth, who is part of Kings XI Punjab team. We catch him at Tress Lounge in MountView where Sreesanth de-stresses at the Wellness Spa. 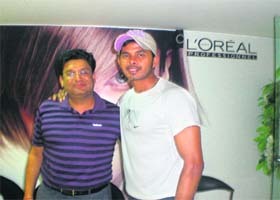 Now, as they say, well begun is half done, Sreesanth is already half way through, with his focus. “It is cricket, cricket and only cricket for me as of now. I am not thinking of anything else,” he shares. “I am focusing on the IPL series and hopefully will deliver my best,” he adds. And no matter wherever you go, how famous you become, it is the family that you always return to. “I definitely miss the ganging with friends and clubbing. All the same, I realise that I am doing this for a reason, which is cricket and IPL season 3 as of now,” says Sreesanth, who is a psychology student, and an awesome dancer. “Dance, ah,” he breathes in, “It is definitely one great stress buster and the love of my life,” he releases his breath. This one is right from the heart! “I like to get my friends to the floor and make them dance.” His favourite genre? “I enjoy all forms - tango, salsa, hip hop. We have a fantastic dancer here; does the Bollywood know about it? He laughs. “After I finish this series, maybe I do something in movies,” he adds with a puckish grin. “Amitabh Bachchan and Hrithik Roshan are my favourites.” Actresses? “All,” he smiles, followed by a hearty laugh. Movies can wait for Sreesanth. As of now, he is soaking in the nice and calm ambience of the city. “I have travelled a lot and Chandigarh definitely is one city I like the most. The relaxed and chilled out ambience is amazing. The facilities that we are enjoying at Oxy Gym at MountView are the best.” And not to miss…he likes to dig into the cuisines here. Just bring it on! It is a matter of shame that our so-called secular country forced such a reputed artist to give up his citizenship. Whatever had happened was over and this was the time to bring him back with full honour. He was a leading artist who added a new dimension to Indian art scene and its sad that we have lost him like this. 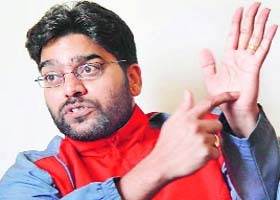 Wherever he his, Husain will be as creative as ever. Many artists come to India and some go abroad from here. Thankfully, it’s not his creativity that is being compromised. In fact, this whole incident might fuel his creativity further. Artists pose questions that the society has to find answers to. This whole issue gives rise to another question, which we as a country need to find an answer to. This comes across as a personal loss, as I have been associated with his work ever since I was 13 or 14. He was and is my idol. It’s very sad that at the age of 95 he can’t work in his own so-called democratic country. I have been fortunate to have personally met the legendary painter. It’s a big loss to the country. People should rise above petty issues and grant artists the credit as well as space that they truly deserve. This whole issue is another reflection on the fact that we do not value our people. Be it art or technology, it’s only abroad that Indians get recognition. India left him no option besides forsaking his citizenship. Since Husain has repeatedly been insensitive and blasphemed Hindu icons; seemingly for gaining public attention; he has fallen in my eyes. Thus, his abdication of Indian citizenship means nothing to me. 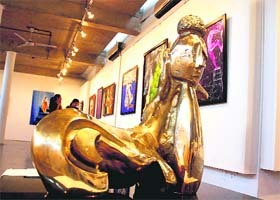 It is another matter that this might commercially benefit Husain in the international art market. Bringing you second day, all the shows. Never mind, the eleventh hour change of English Auditorium events being shifted to Evening studies Auditorium, it’s a carnival of performances one after the other. Again at Law Auditorium, one of the four venues, there’s classical dance performance. “In total, we have four teams participating in the classical dance performance and for creative dance there must be around six,” said Shikha Kanda, UIAMS student, participant. Witty Punjabi compeering kept the tempo high and around mid noon the place had people falling over, headcount outnumbering the seats. Boy was there dearth of hooters? No wonder, the compeer remarked, “Do we have conductors here or students?” The rowdy crowd proved the former! Likewise, with bhangra and giddah later in the afternoon. Wish there weren’t a constant flow of people walking in and out of the performances. Another popular venue, at Students Centre, is a riot of colour with Tomorrow’s World as the theme for collage and International Women’s Day as the one for poster making. Elsewhere, there’s out and out musical treat for classical lovers. With classical vocal (Indian) and group song (Indian) lined up for the day. That’s not it. There’s packed in debate and elocution and group discussion into the itinerary as well. Talking of which there was Mr and Ms Panjab University scheduled later in the day, the event that posters have been announcing proudly for a fortnight now. Did that send the imagination on a skiing spree? With more and more people taking to the Internet to find partners, the question that arises is whether we can trust the information that people provide about themselves via online dating services. Jeffrey Hall of the University of Kansas is lead author of the paper on Internet dating, which shows that people looking for romance online actually behave very much as they do in face to face dating and relationships. “Our findings dispel the myth that people using online dating are that different than any one else who might find a relationship through friends, school or work,” Hall explained. His team investigated over 5,000 individuals dating online in search of long-term partners, from all walks of life and over a wide age range (18 to over 60). The survey included questions on personality traits such as openness, extroversion, education and income. “We also asked a series of questions on an important trait that we call self monitoring,” Hall said. “Self monitoring is about how we try to present ourselves in a favourable light to others, to make people like us,” he stated. Someone who scores as ‘low’ on self-monitoring is extremely authentic when describing themselves in all circumstances, and those who score ‘high’ are more prone to so-called white lies. Self-monitoring scores turned out to be a major factor in the likelihood of people changing their presentation to others across all dating indicators (topics such as previous relationships, likes, dislikes, appearance, etc). Whether people are likely to lie about themselves online also depends on what kind of people they are. Someone who is very open to new experiences (e.g. foreign travel) is highly unlikely to misrepresent themselves about their experiences - because they are naturally interesting people. On the other hand extroverts are more likely to misrepresent themselves when describing past relationships. Extroverts tend to have many past relationships because they meet new people easily, but may play this down when looking for a new relationship. The good news, according to Hall, is that the likelihood of people misrepresenting themselves overall is actually very low. The research also showed that not all men are from Mars and Women from Venus - the differences between individuals was far greater than any difference between the sexes. However women were somewhat more likely to fib about their weight, whereas men were more prone to tell white lies on other subjects, such as how many previous partners they had had, or how serious they were about finding a long-term relationship. SANDRA BULLOCK: Obviously, Sandra Bullock thoroughly deserved the best actress award for dying her hair blonde, but someone should have told the restored brunette that it's a good idea to look in the mirror before deciding on your red carpet dress. This Marchesa gown (to use the term loosely) looks like the sort of doily one might find under a teacake in a Brighton B&B, appears to be made out of panne velvet (not good outside of Camden Market), although that might be a cruel trick of the light, is in a colour that makes the actress look washed out to the point of no return. As for the lipstick ... vintage clothing might be de rigueur but antique make-up is uncouth. SARAH JESSICA PARKER: If proof were needed that Sarah Jessica Parker thinks she's it then it comes in the form of this gown, hand-crafted for her by the greatest living couturier, Karl Lagerfeld, still working his magic after all these years for that grandest of French houses, Chanel. "Mr Lagerfeld so nicely made it for me," the clothes horse gushed, adding that she didn't want to give it back, which might not unreasonably be perceived as hint-dropping on a grand scale. Her gown is a very pale primrose and not an easy shade, but about as modish as a colour can be. The embroideries are exquisite, the jewels are restrained by red carpet standards and it's safe to assume she will have returned these at least by now and to Fred Leighton from whence they came! GEORGE CLOONEY: How handsome is George Clooney with his steely gray locks and big manly hands? And who, therefore, cares one iota what he wears? His tuxedo was cut by Giorgio Armani if anybody's interested (but of course!) and suitably dapper it looks too. Is there just the merest hint of the perma-tan, Valentino Garavani-style, to his skin colour, though, or is the actor just an outdoorsy type? The bronzed physique is probably attributable to the latter or, at least, that's what one would like to think. "There are dresses everywhere," he said on the red carpet on Sunday night. "It's a minefield out there." Indeed. KATHRYN BIGELOW: There's good retro and bad retro and this red carpet gown is the former. It's Yves Saint Laurent but looks like it might have been designed by Norman Hartnell for a young and swinging Princess Margaret in the early 1960s which is suitably cool and thank you, Yves Saint Laurent designer, Stefano Pilati, for that. This particular fashion superstar has had a very good run on the red carpet recently. He dressed Kate Winslet last year when she won the best actress award and again this time, for that matter. Mr Pilati earns even more admiration for the fact he hasn't opted for the type of sugar-almond hue that aforementioned blue blood might have chosen at that point, but has chosen instead a contemporary shade which falls somewhere between ‘mushroom’ and ‘donkey’ to use highly technical fashion parlance. The Hurt Locker director's small but perfectly formed clutch bag matches her dress. Hindi film actor Ashutosh Rana has said that movies made in the country's southern states were based on local issues while Bollywood films seemed to touch international matters. "Films in the southern States of India represent the local culture and were based on very local issues in comparison to Bollywood films," Rana saidFilms of south India were not targeting overseas viewers and they were made for local people, the Bollywood cine star who was here to deliver a lecture on ‘Indian Theatre and Folk Art’ at the Dr Hari Singh Gour Central University said. He said the southern states of the country have more cultural and folk art and are more prosperous in literature compared to other parts of the country. Stating that he was feeling honoured at being able to study at Dr Hari Singh Gour University, Rana said the Performing Arts Department had shaped him up as an actor and full credit went to his guru and the Department. 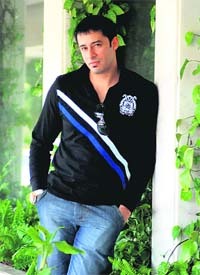 The Bollywood film actor said that six of his films were released last year and out of them, four were super hits. For a male model, there are two confirmations on popularity: zealous females, jealous males! And boy, does model-turned-actor Zulfi Syed fulfil both? In city, at Piccadilly Hotel-22, here's a quick one-to-one with him and taking note of his monosyllabic answers. Also fitting into the conversation are Bangalore, Chandigarh, Bollywood, his college days, reality shows. "I'm here to judge the competition, Mr and Ms Panjab University," he begins on a little querying. Post the very recent hockey affair, so that's what brings him to the city, once again? "But my visit this time is for an entirely different purpose. Moreover, it reminds me of my own experiences. That's how I started through a similar event in Bangalore. Moreover the college culture here and in Bangalore is quite similar." Also similar is his "got discovered in college, to modelling, to Bollywood" story. Guess we missed out the reality show Big Boss? Was it disheartening getting through till the closing stage and losing in the end? "It doesn't matter." Well, that's it, about the entire incident? "It was quite a different experience altogether. It was real, nothing's scripted as most people say." Back to his business for the day, the evening contest. "I'm going to be judging on the basis of their potential, rest I don't think it's going to be Ms India sort of a thing involving lots of questions, it's going to be more on the fun side." Talking of which, Panjab University and students that is. "I have a lot of friends from this place like Bunty Grewal, Jatin Grewal." That's not all to the city. "I've been here many times and love being here, it's a very clean, green and organised city." Anyone with an opinion on city or fashion certainly has to have one on the very recent Chandigarh Fashion Week. "It's a good thing, it raises awareness. The people who are criticising shouldn't do so, the same stuff is happening everywhere, we have so many fashion weeks now. It's a good thing." Cut to Bollywood once more and his future projects. "I have an action movie lined up in August which has been directed by Asad Sikander" And…"Nothing, as of now. Apart from this movie, ramp and modelling shows." He's done and so are we. It was rocking. But it rocked only the ones interested in rock. Bet, half the crowd confused the genre for wrestler Rock! Anyways never mind, move on, oops… rock on. The crowd was good, turnout could've been a little better. But isn't it, that the head banging activity called rock has always invited a niche audience? There was a DJ, a rapper, two Delhi-based bands to begin with. The group GOD themselves sent the hard rock lovers jamming. 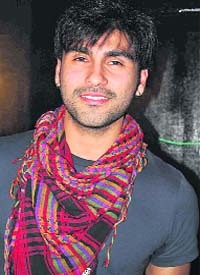 Adds Karan Sharma, a law student, "I'm a hard-core hard rock lover. Not many people present enjoyed that sort of music but I personally loved it." To each his own! The event kicked up just a little later than scheduled, anyways one after the other performances more than made up for anything. Meanwhile, yet another take. 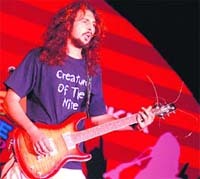 Says Ankit Ahuja, B Com student from Government College, "As it is, in Chandigarh, we don't have a lot of rock concerts. Wish they'd invited more bands and the event lasted a little more." Fitted in between was acoustic, Indi-pop music, a song by Bryan Adams, a female DJ kept playing in the corner. 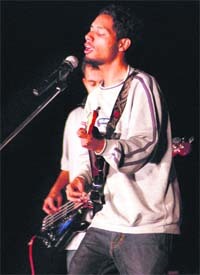 The rapper Nawab struck quite a few chords with his own compositions. The only ones disappointed were, perhaps, Bollywood music buffs. "We very rarely have rock concerts and activities in this genre, some are here purely for the music, others for checking each other out, still others are here for pure fun," declares Sneha Arora from Savitri Bai hostel. More than anyone, the hostellers topped the list. Two months ago, when Anju Paliwal, Vanshika Sharma and Mallika Chabba began making artworks for their first exhibition, they knew what would they call it, "Ethereal, a divine experience. And it was a dream come true when they got the booking for the exhibition hall at the Government Museum and Art Gallery. To realise the dream, three of them made over 10 works in just two months time. "The quality wasn't compromised. We wanted our work to be noticed by the art connoisseurs of the city and this was the best opportunity", says Anju. The beginning of their career and the beginning of the world has been depicted by Anju in a painting, which has two fishes running in a circular motion. "Fishes reproduce the fastest and were also the first creature on the earth," says she. From choosing the complex themes like multiple faces of the human being to simple one like a monk in a monastery, Anju has preferred to make diverse art works, "I have made figurative, abstract and real art for the exhibition." She has also made a self-portrait that has her soaking in the sun. A contemporary art form has a bicycle and the map of Chandigarh. Vanshika has depicted her life story through the painting made on butterflies. It has several colourful butterflies and two frames placed strategically inside the painting. "It shows how butterflies like us human beings are free to move but can't cross a certain area because of responsibilities," she says. A few paintings she has made on villagers. "The theme is special as it gives liberty to use as many colours and varied expressions, which isn't the scenario in the cities," says she. The Kundan Mela at Tanishq, India's most innovative jewellery brand, turned out to be a big hit today on its first day. The mela slated till March 20 at the Tanishq outlets in Sector 17, Chandigarh, Manimajra and Mohali, are showcasing a wide range of designs from the latest Kundan collection from Tanishq. In India, kundan jewellery is an essence of feminine grace Tanishq has organized the Kundan Mela after understanding the fondness among women towards exquisite kundan jewellery. Speaking on the Kundan Mela, Mayank Kampani, area business manager, Tanishq, said, "At Tanishq, we have always strived to be a part of every celebration in the life of the Indian Woman by providing her the perfect range of precious jewellery that fulfils her needs. This Kundan Mela is an attempt to offer extensive choices to our discerning customers from wide repertoire of our designs."